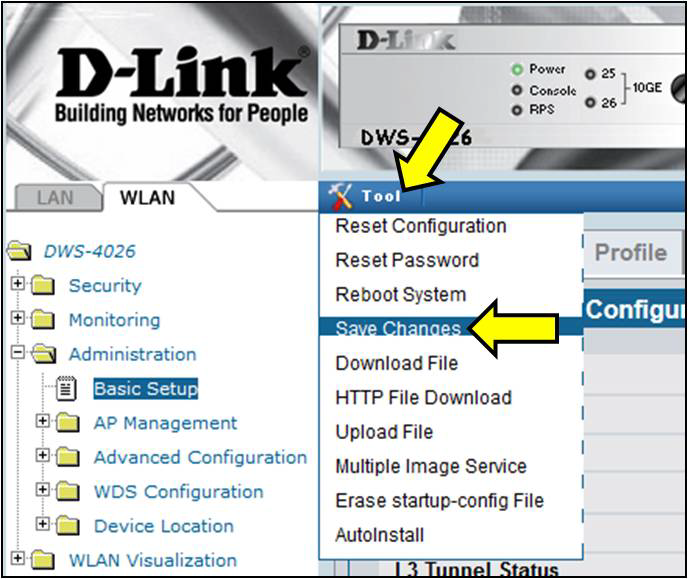 How to setup an IP address and default gateway on D-Link DES-3010FA/GA switch via the CLI? Below is the syntax to configure an IP address and default gateway on the DES-3010FA/GA switch via the CLI. Note: The copy running-config startup-config comamnd will save all configuration changes. 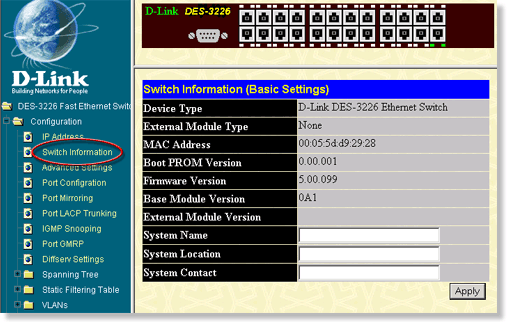 How do I upgrade the firmware on D-Link DES-3226 Switch? The firmware upgrade process for all D-Link managed switches runs over TFTP. You will need TFTP software running on the computer that has the Firmware file on the local hardrive. If you do not have TFTP software, it is freely available on the Internet. The Firmware upgrade procedure requires an Ethernet connection between the switch and the TFTP server. You must be able to access the switch through Telnet or the Web based configuration from the computer that is running the TFTP software. Although there are many different ways to configure the switch, it is easiest for you to use the Web based configuration when upgrading the Firmware. 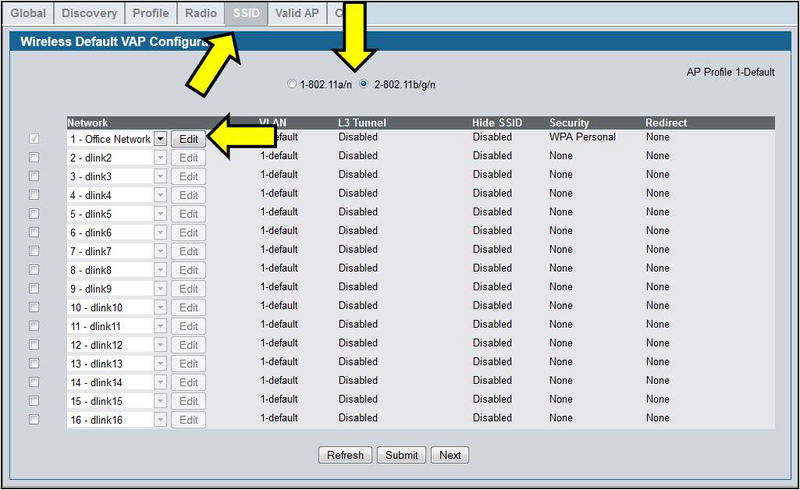 The Web based configuration of any D-Link switch can be accessed by entering the IP address in the address bar of any Java-enabled browser. The default IP address of the D-Link DES-3226 is 10.90.90.90/255.0.0.0. 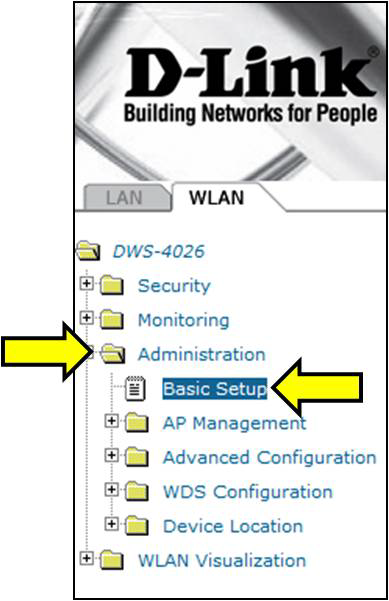 If you are unable to access the web based configuration, connect to the switch through Hyperterminal and reset the switch to Factory default. If you have made configuration changes to the switch, make sure that your TFTP server is on the Management VLAN, and that it can PING the switch. Step 1 Open your Web browser and enter the IP address of the DES-3226 in the address bar (10.90.90.90). Select Login at the top of the web page. When prompted, enter the username/password that you have assigned to the switch. By default there is no username or password assigned to the switch. Step 2 From the folder tree on the left-side of the page select Maintenance>TFTP Services>Update Firmware. Step 3 Enter the IP address of the computer running the TFTP software in the field labeled Server IP Address. In the field labeled File Name, enter the path to the firmware file that is on the local hardrive of the computer running the TFTP software. Make sure that you include the file extension of the firmware file when specifying the directory path. Step 4 Make sure that there is TFTP software running on the computer who-¦s IP address was entered in the Web based configuration. Click on the Apply button, and then click on Start. Step 5 During the upgrade process this is what you should see. 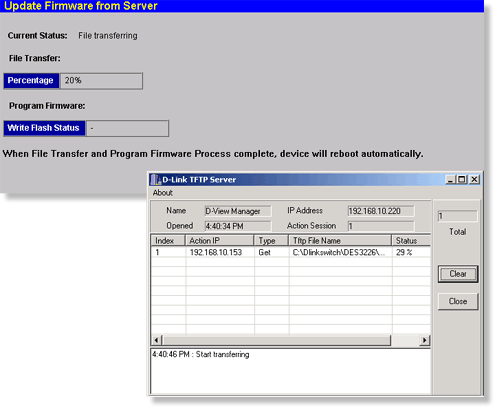 The D-Link TFTP software is also shown in the below screenshot which will also display the firmware upgrade status. Step 6 After the Firmware upgrade is complete the switch will automatically reboot. Wait 1-2 minutes and then reconnect to the switch. Login and select Configuration>Switch Information. The field labeled Firmware Version should now display the Firmware Version that you just upgraded to.